From the white pulp of the cacao pod to the dark velvety candy, the path chocolate takes from bean to bar is a fascinating one. And travelers can follow along as companies reveal the whole process, starting with fermenting the beans and ending with molding cocoa liquor into delectable bars and bonbons. As the craft chocolate movement and people's food curiosities have grown, chocolate makers have become excited to share their obsessions with quality and innovative techniques by opening up their factories to the public. Learning has never tasted so good. I've explored the world of artisan chocolate with both well-established chocolate makers and those with brand-new offerings. From the simple and raw to the classic and refined, here are a few of my favorite places to experience bean-to-bar chocolate. This past February, Michelin-starred chef Alain Ducasse of Plaza Athenee fame added a brand-new venture to his Paris repertoire: Le Chocolat Alain Ducasse, the city's first bean-to-bar atelier. According to his trusted chocolate maker Nicolas Berger, who has worked with Ducasse for 13 years, the goal of the shop is to "create artisan interest in chocolate and make something different in Paris that is part of [chocolate] education." And visitors can learn just how it's done, from roasting the beans to refining and conching them into rounded particles of 20 or fewer microns (translation: chocolate so smooth you'll want to die while tasting it). Unsure of the factory's exact Bastille-neighborhood location, I walked slowly down rue de la Roquette until I was stopped in my tracks by an intense scent of cocoa coming from a small courtyard. As I proceeded in, I could see large burlap sacks of beans stockpiled on shelves and heavy machinery through tall glass doors. Entering the adjacent retail store was like stepping inside an elegant plantation warehouse, with an antiqued bonbon case and rows of chocolate bars packaged in simple brown paper. A chocolate statue of a Maya warrior by Timothee Gauguet was a reminder of where the "food of the gods" came from. Don't Miss: Berger's signature bars by origin (Java, Madagascar, Peru, etc.) and bean type (trinitario, forastero, and criollo), as well as flavored ganaches like cassis, mint, and passion fruit and coconut. "Small batch" is what's big at Dandelion Chocolate, a new bean-to-bar factory and cafe in San Francisco's Mission District. Here, the focus is on quality, not quantity: Made in small amounts (with no batch exactly the same), at any given time nearly all the chocolate is on display, and it sells out almost immediately. Ingredients are limited to cocoa beans and sugar (forgoing the usual added cocoa butter, vanilla, and soy lecithin), and the bars focus on origins such as Patanemo (Venezuela) and Ambanja (Madagascar). Part of an explosion of chocolate makers in the U.S., Todd Masonis began Dandelion in 2010 with his business partner Cameron. According to Masonis, "As a hobby, we started roasting up beans and building machines, and we started making small batches of chocolate. We were only concerned with getting the best flavor, and before long, we shared our chocolate with close friends and family. … From there, we started selling our chocolate in markets and winning awards and it's sort of evolved from there." The latest piece of the evolution is an inviting cafe focused on hot chocolate (and related treats), which opened in mid-January. Patrons can pull up a stool and watch the chocolate production while they sip. Don't Miss: Hot (and cold) chocolate, like the Italian-inspired European Drinking Chocolate and Vanilla-Lemon Iced Chocolate, daily pastries from the creative whims of Chef Phil Ogiela, and the bars, which are packaged in house-designed paper printed in India. In my hometown of Somerville, Massachusetts (three miles from downtown Boston), Taza Chocolate brings cocoa beans to Beantown and transforms them, Mexican-style. Cofounders Alex Whitmore and Larry Slotnick keep things authentic by opting to produce chocolate using hand-chiseled Oaxacan molinos (stone mills). Unlike ultra-smooth European-style chocolate, the resulting texture is decidedly gritty, with remaining bits of cacao and raw sugar crystals (plus any flavorings). With few ingredients and minimal processing, the "chocolateness" of the bars is heightened. The bars are 100 percent organic, and just about anyone can enjoy them since they are vegan, kosher, and free of dairy, gluten, and soy. Don't Miss: New bars like Coco Besos with shredded coconut, Chocolate Mexicano Disks in flavors such as Cinnamon or Salted Almond, and recipe cards for making Mexican hot chocolate with any Taza bar (I recommend Guajillo Chili). Thanks to a strong culinary tradition and top chefs like Paul Bocuse, Lyon is often referred to as France's gastronomic capital. Strengthening that moniker is the city's own Bernachon, one of the most famous chocolate makers in all of France—and the world. Started in 1953 by Maurice Bernachon, the shop is classically French in style but has a bean-to-bar approach that began well before its time. Now run by Maurice's grandson Philippe (whose other grandfather happens to be famous chef Paul Bocuse), Bernachon is a patisserie in the front and a factory in the back. Initially, it impressed with luscious cakes, viennoiseries, and all flavors of handmade truffles and bonbons. However, unsuspecting visitors would hardly know what lay beyond the back door: a multi-room workshop with the feel of a rabbit warren (chocolate rabbit, of course). Led by a guide, I walked through a long corridor storing wooden pallets filled with chocolate hens, eggs, and other Easter-themed items. We then passed through rooms for baking, cake decorating, and at last, chocolate making, where cocoa beans were ground into cocoa mass and eventually tempered, and where chocolatiers filled molds to create distinctive bars like the Jour et Nuit (milk and dark chocolate) and Kalouga (salted-butter caramel). Don't Miss: Palet d'Or, a chocolate laced with gold leaf, and the President cake, a chocolate genoise with hazelnut praline, cherry confit, and chocolate shavings formed in the shape of a giant pom-pom. 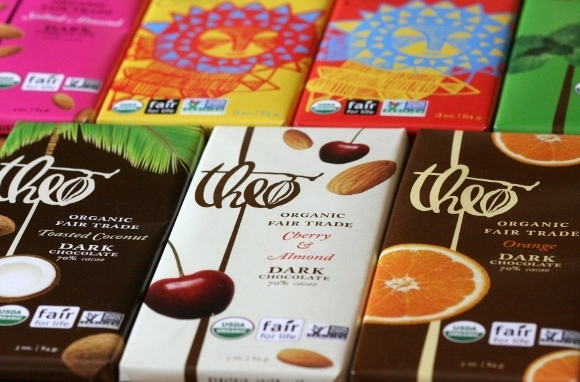 With fair-trade, non-GMO certified chocolate and the claim of being the first fully organic bean-to-bar chocolate maker in the U.S., Theo—aptly named after the cacao tree's scientific name, theobroma cacao—clearly puts high priority on sourcing and sustainability. According to the company, "Theo is founded on the belief that there is a common thread that binds us, from the cocoa farmer to the chocolate lover, and we’re devoted to making our world a better place." To make good on that promise, it pays farmers more than twice the conventional market price for their beans. Free of emulsifiers and additives like high-fructose corn syrup, Theo's classic bars offer nothing but pure chocolate flavor. Most bars are sold by cacao percentage and some include nuts, spices, or fruits. Others take things a step further and involve special partnerships. Its new Congo bars, for example, are made from 100 percent Congolese cocoa through a collaboration with Eastern Congo Initiative (a nonprofit founded by Ben Affleck). At the factory in Seattle's Fremont neighborhood, visitors learn about the history and science of chocolate and can walk through the chocolate-making process, where beans are roasted and milled into nibs, refined and flavored, and ultimately molded and packaged in colorful wrappings. Chocolate samplings are included. Don't Miss: Classic milk and dark chocolate bars, plus flavored versions like Orange, Mint, and my top pick, Cherry & Almond, as well as the Congo bars, including Pili Pili Chili (with spicy peppers) and Vanilla Nib. While all the chocolate makers on this list will take you from bean to bar, The Grenada Chocolate Company will also take you to the very cacao groves where the beans come from. Through a strategic alliance with cocoa producer Belmont Estate, travelers to the "Isle of Spice" can go right to the source and see beans being brought in from the field and then fermented in banana leaves and dried by the sun. Those beans—all certified organic and part of a cooperative of about a dozen local farmers—are grown on the estate and used by the factory (about a mile away) to make fine dark chocolate. It doesn't get much fresher than that. Don't Miss: Bonbon Chocolates, the on-site factory outlet that sells candies made with Grenada spices and fruits, Grenada Chocolate Company bars by cacao percentage, and tea made with cocoa balls that have been spiced with nutmeg, clove, pimento, and bay leaf. Tour Information: Several different tours are offered at Belmont Estate. While regular tours of the chocolate factory aren't available, groups can ask for them by special request. At TCHO (pronounced "cho" like the first syllable of cho-co-late), Silicon Valley intersects with San Francisco's food culture in the sweetest way. Originally started by an ex-NASA engineer, the company is now helmed by the cofounders of Wired, Louis Rossetto and Jane Metcalfe, who run it like a genuine start-up. Here, innovation and technology are key components for making chocolate: iPhone apps allow chocolate makers to control aspects of the company's "Flavor Labs" remotely, and the cloud-based database Cropster helps farmers and TCHO workers share information in real time. Customers are part of the process as well and can sign up to be beta—and taste—testers. At TCHO's factory on Pier 17, visitors have to wear the requisite hairnets and closed-toe shoes but get to see firsthand how the square-shaped bars are made, from conching and molding to wrapping them in their distinctive packaging. Knowledgeable guides offer briefings on the company's direct-trade sourcing program and explain how the company collaborates with farmers to produce flavor-focused cacao that reflects the various soils and climates in which it's grown. Don't Miss: TCHO's PureNotes dark chocolate bars with names based on inherent flavor profiles like Chocolatey, Fruity, Nutty, and Bright, and bonbons such as Sea Salt and Roasted Nib Caramel from budding confectioner Ryan Holmes (also look out for his latest, the Hops and Chocolate truffle). With its proliferation of artisan purveyors—including chocolate makers—Brooklyn has become a hotbed for the latest food trends. And at the New York City borough's own Fine & Raw Chocolate, sugar and additives are out and authentic chocolate flavor is in. What sets the company apart from other gourmet makers is that its chocolate is processed raw (i.e., by dehydrating beans at a low temperature for at least eight hours). Because the cacao remains virtually in its natural state, antioxidants—as well as chocolate flavors—are preserved, resulting in a bar that not only tastes good but is good for you, too. The ingredients—including heirloom cacao from Ecuadorian rain forests, virgin cold-pressed coconut oil, and blue-agave nectar (which is lower on the glycemic index than sugar)—also differentiate Fine & Raw's handmade chocolate. According to founder Daniel Sklaar, "We constantly look for the best ingredients in terms of flavor. The ingredients also have to be whole foods. Coconut butter is nothing short of superlative. When you open tubs of it you want to dive into the pails. Heirloom cacao has been harvested and grown in a way that is thousands of years old … it's a great concept." Started in Sklaar's Williamsburg loft, the company recently opened a new factory in nearby Bushwick and will soon allow people a glimpse into the raw-chocolate-making process through tours. Until then, visitors are welcome to purchase bars at the shop or enjoy chocolate drinks at the cafe. Don't Miss: Bars like the Sea Salt (made from raw cacao, crystal palm sugar, raw cacao butter, and sea salt) and the Lucuma & Vanilla (with raw cacao paste, agave nectar, cacao butter, and lucuma, a fruit native to Peru). The Cacao & Coconut Chunky Bonbon is also a fan favorite. Tour Information: According to Sklaar, factory tours are to be announced but will likely start early this summer. Follow the latest updates by "liking" Fine & Raw on Facebook or following its blog. I hope you enjoyed reading about my favorites. Where have you experienced bean-to-bar chocolate? Read the original story: From Bean to Bar: Chocolate Worth Traveling For by Anne Banas, who is a regular contributor to SmarterTravel. The story is also featured on USA Today.